This bright red poppy lip crayon is perfect for giving you a right royal pout. The colour is rich and the formula is moisturising and non sticky – so ideal for tucking into lots of victoria sponge cake. The crayon also comes with a sharpener on top of the lid and a cleaning tool – the ideal companion for a day out! These fantastic novelty nail wraps are a fun adornment for your talons. They may be a little kitsch for everyday but it’s not everyday that we celebrate the Diamond Jubilee. If you are looking for a more subtle and sophisticated way of getting patriotic then why not try updating your make-up look. This chrome finish blue liquid eyeliner with a hint of shimmer is great for creating that classic cat eyed flick with a bit of a twist. Pair with red lips. According to the weatherman, apparently this weekend we can expect rain. 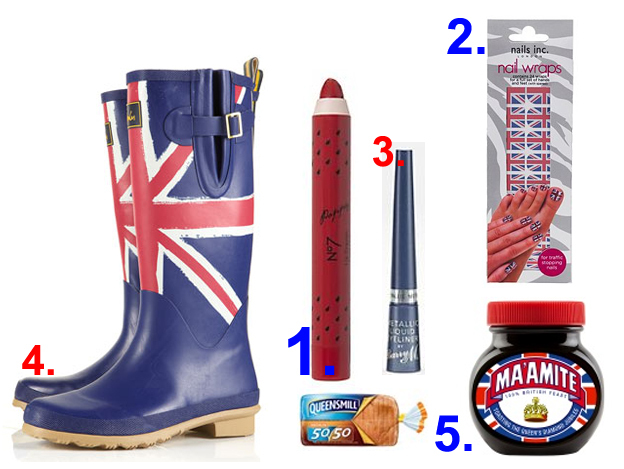 We hope he is wrong, but if he isn’t and you’ll be taking lots of long family strolls then what better to stroll in than Union Jack wellies!? What will you be chowing down on over the bank holiday weekend? If sandwiches are on the agenda then pop out to the supermarket and pick up a Marmite special addition jar of ‘Ma’amite’ and a loaf of Kingsmill ‘Queensmill’. Love it or hate it you have to admit it’s cool.